Well, it is Monday again, time for In a Vase on Monday with Cathy! Today's vase was a hurriedly contrived affair: one stem of rose 'Sterling Silver' collected, set in a vase, and photographed as the sun was setting. 'Sterling Silver' has flowered magnificently this autumn. Many blooms are just a bit dry as I haven't been watering heavily; but this bud was near-perfect with the help of our recent rainfall. And the scent is incomparable: a full, sweet fragrance, unmistakably rose and as quiet and graceful as the color of the blooms. The vase is one I nearly discarded but have since decided is perhaps worth keeping around. The top was fluted in much the same manner as I would flute a pie crust, pinching the clay inward and out with my fingers. I am hoping to be able to replace 'Sterling Silver' in the new garden, but I'm unsure whether I can get another. Growers seem to be phasing it out in favor of lavenders reliable in a wider range of climates. Perhaps I can't blame them, remembering how it sulked in my first garden - defoliated by black spot each summer and nipped by cold in winter. 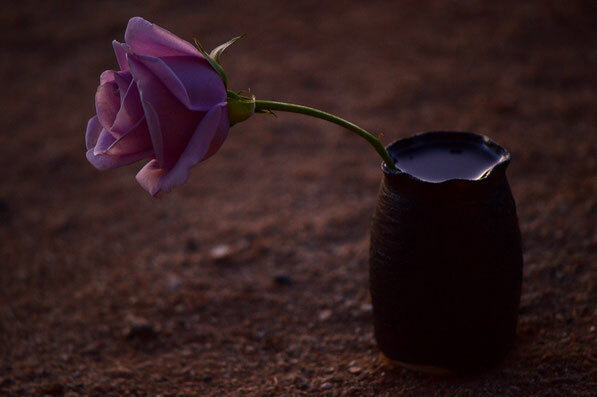 For all that, I find it is a very special rose here in the desert, having grown far larger than expected, and being healthy and free-flowering. And it is a superbly beautiful rose. Finally, during my breaks from packing out and generally getting everything ready to leave, I have been perusing a new garden book: The Romantic Herb Garden by Caroline Holmes. I discovered it in the discount section of Pinetree Garden Seeds website and added it to my order of seeds. 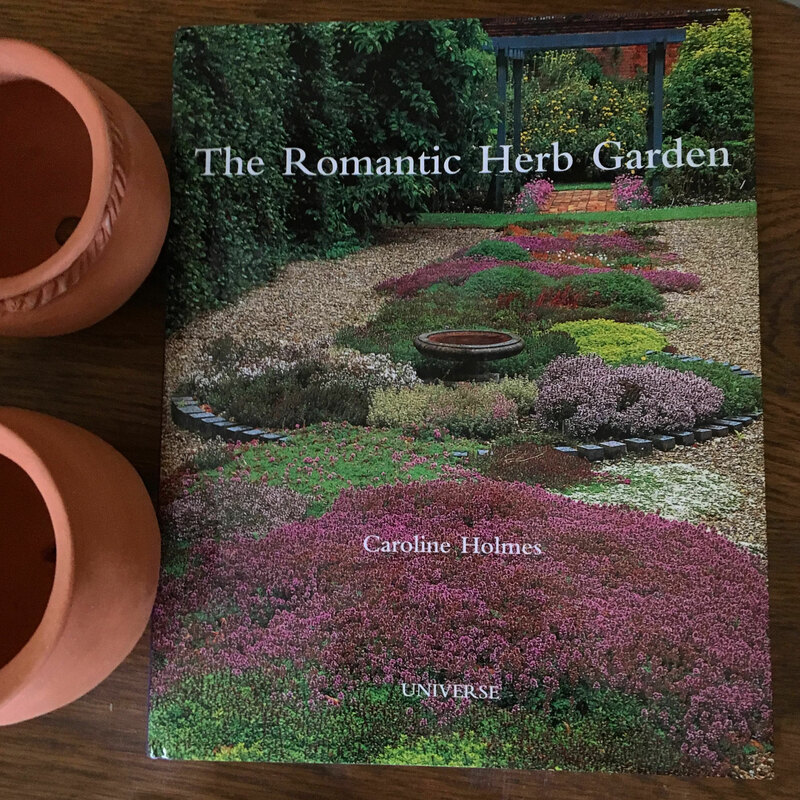 I have long loved using herbs in the garden. Perhaps this will encourage me to take that a good step further? 'Sterling Silver' perished here and I've heard the same comments about it being touchy. 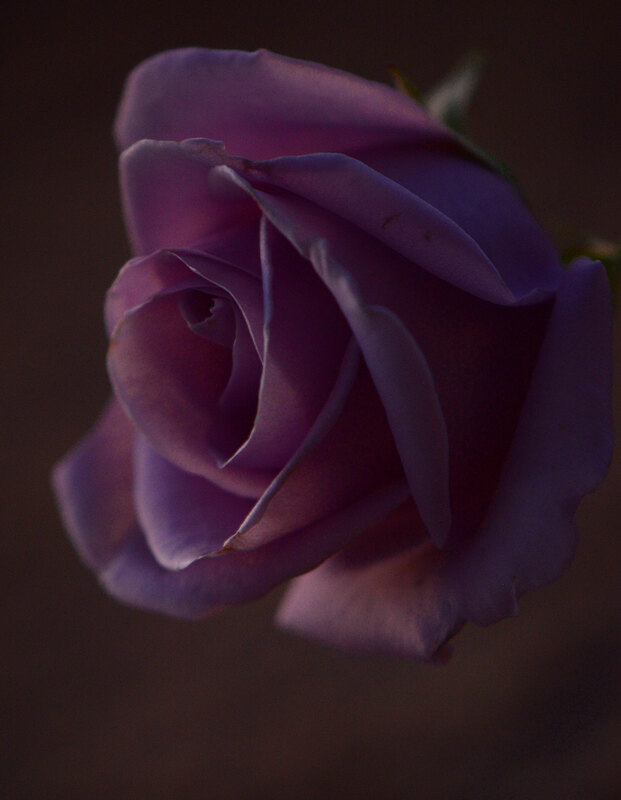 I'm sure it'll please some future resident of your current property and that you'll find a suitable lavender-colored rose for your new site. Best wishes with the ongoing packing! 'Sterling Silver' is a beautiful rose, I love purple and lavender roses but they are very prone to diseases in my climate and never look great, I have grown 'Sterling Silver', 'Blue Moon', 'Lady x' and 'Blue Parfume' but unfortunately they are very poor performers in my garden. Could you try cuttings of your favourite rose? I did lose some of the plants I tried. But some were amazingly successful. Hibiscus tialiaceus is so tall I can't 'see' the flowers - and that was a twig with a few leaves. Hello Amy, ‘Sterling Silver’ is truly beautiful. Roses grow so easily from cuttings and now is a perfect time for you to take some, so that you can carry this memory to your new home. Good luck!